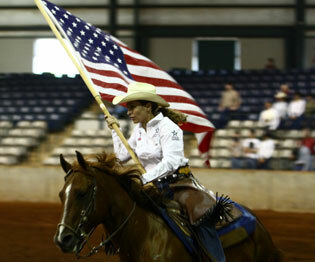 Are there horse requirements like breed, or registration? No. You can use any horse or mule that you want. Some horses take to this sport easily, others do not. It is up to your horse's temperament and your desire to train him or her to get used to shooting, turning, and going fast. 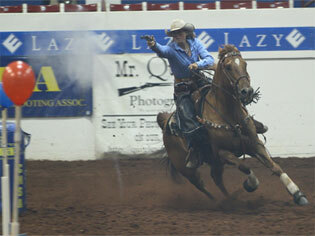 Some riders will use earplugs for themselves and their horses. 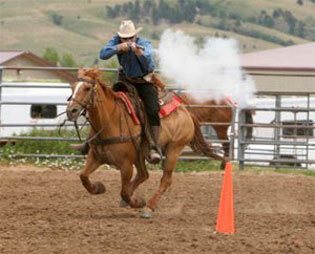 Mounted Shooters use .45 caliber single action revolvers like those used in the late 1800's. Single action revolvers must be cocked each time before firing by drawing the hammer back. A double action revolver can be fired by simply pulling the trigger, without cocking the hammer. Despite the use of double action revolvers in the Old West, the CMSA limits our competitions to single action revolvers. Only fixed sight single action revolvers of .45 Colt caliber, designed prior to 1898, or reproductions thereof, shall be allowed in CMSA competitions. Examples are: Colt Single Action Army or Bisley Model, Smith & Wesson Schofield, Russian, or Remington Models 1875 & 1890, their reproductions and Ruger Vaqueros, Bisleys or Montados. Riders can buy 'off-the-shelf replicas' of the old time gun belts and holsters. Or, you can have custom-made gun belts and holsters to suit your wishes. There are several custom 'makers' that you can find in 'old west' magazines. Do you use live ammunition (lead bullets) or bird shot? No. The cartridges fired are called .45 caliber Long Colts. The brass cartridge is loaded with black powder (like that used in the 1800's). This load will break a balloon up to about 15 feet. Live rounds are strictly prohibited at competitions. Yes. 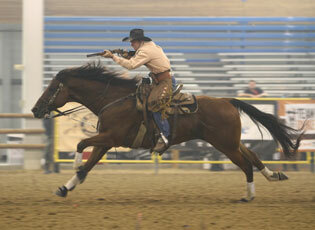 There is a Men's Division, a Women's Division, and a Senior's Division, with Classes 1-6 in each of those divisions. 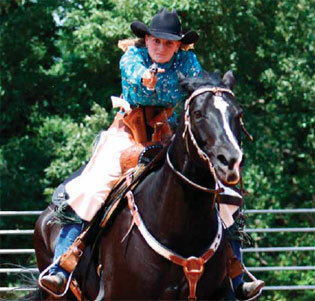 There is also a Wrangler Class for those 11 and under. All riders start at Class 1. When a rider gets a qualified win as a Class 1 four times, they advance to Class 2, and when they get a qualified win in Class 2 four times, they advance to Class 3. Four wins at Class 3 and on to Class 4, 5 wins at Class 4, etc. Yes... and no. 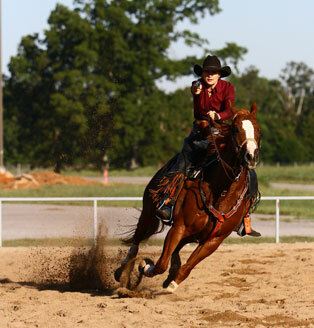 The riders in the Wrangler class ride the same pattern that the grown-ups do, but they may shoot Hollywood cap pistols, engaging each target as if they were shooting real blanks. They then shoot the real McCoy (.45's with blanks) at balloons, from the ground while standing stationary with mom or dad at their side. Yes. There are 50+ possible patterns. The patterns everyone will ride can be pre-determined or can be drawn out of a hat on the day of the competition. A competition may consist of 3 to 6 patterns a day. Each pattern consists of 10 balloons. To give you an idea of riding a pattern, let's say that there are 5 white balloons and 5 red balloons. The 5 white balloons may be grouped together in one place or spread out over the entire arena. The rider shoots all 5 white balloons first. 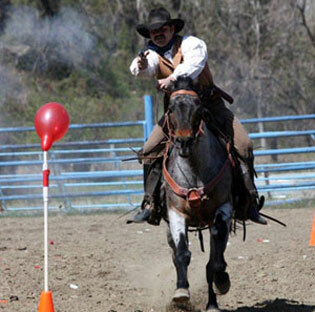 Then, the rider holsters the first gun while riding to the far end of the arena, draws the second gun, and shoots the 5 red balloons, which are usually 5 in a row straight towards the finish line. This is called 'the Rundown'. 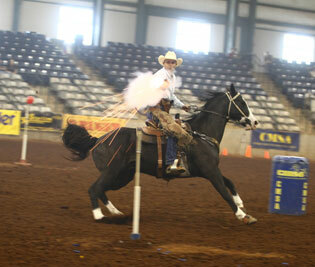 CMSA Pro status is available to all Classes and Levels of competition. To be eligible to enter any sanctioned CMSA Pro or stand alone CMSA Pro event the CMSA member shall possess a CMSA Membership Card with Pro status noted. Cost is $50.00 per competition year and can be purchased on the cmsagear.com site. For information on CMSA dress code exclusions pertaining to wearing promotional logos, see Section 8.f i-x in the rulebook for complete details and restrictions. $70 Includes full rights to compete and points tracked by State, Region & Nationally. Members receive an annual competition card, full login rights to the CMSA website, current rulebook and a subscription to the official publication of the CMSA, The Rundown. Individual through an Affiliated Club: $70 (Must be paid with a CLUB check – Find a Club Near You) - Includes full rights to compete and points tracked by Club, State, Region amp; Nationally. Members receive an annual competition card, full login rights to the CMSA website, current rulebook and subscription to the official publication of the CMSA, The Rundown. $100 Includes full rights to compete and points tracked by State, Region & Nationally for your entire family. Each family member receives an annual competition card, full login rights to the CMSA website, one current rulebook per family and a single subscription to the official publication of the CMSA, The Rundown. Family through an Affiliated Club: $100 (Must be paid with a CLUB check - Find a Club Near You) - Includes full rights to compete, have your points tracked by Club, State, Region & Nationally for your entire family. Each family member receives an annual competition card, full login rights to the CMSA website, one current rulebook per family and a single subscription to the official publication of the CMSA, The Rundown. $35 Associate Membership is a one year developmental class and as such do not receive points, payback or prizes of any kind. Associate Members will count as a point (or points) for all competing Members who finish above them at a WPQ event. Associate Members may compete locally in WPQ and DWPQ events, but not at State, Regional, Classic or Championship Series events. $450 Includes full rights to compete and have your points tracked by Club, State, Region & Nationally. Members receive a Gold Life Competition Card that never requires renewal, full login rights to the CMSA website, current rulebook and a subscription to the official publication of the CMSA, The Rundown and a plaque commemorating your lifetime commitment to the Cowboy Mounted Shooting Association.